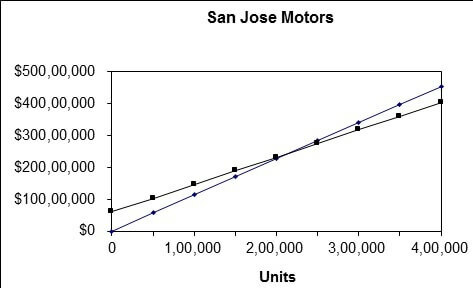 San Jose Motors is a small company that produces motors for specialized equipment sold primarily to research laboratories and a major U.S. defense contractor. The operation is family owned and has been in business for 15 years. The company produces and sells three motors, named Motor 5, Motor 10, and Motor 15. Bob Noonan was recently hired as an accountant and reports to the controller, Jennifer Mackey. Bob has been performing routine types of accounting work, but he would like to become more involved in cost control and in analyses to help the managers make decisions. Recently, he performed a cost-volume-profit analysis of the company’s three products, as shown below. The analysis was based on data from last year’s accounting records. Bob asked Jennifer for an opportunity to present his CVP analysis at the next weekly managers’ meeting. Jennifer had used CVP in the past, but had not formally presented it to the managers. She asked Bob if he had updated the prior year’s information for expected changes. Bob said he had thought about doing that, but did not know where to get that kind of information. Jennifer suggested that he bring his laptop to the meeting and ask for updated information from the managers at the meeting. Jennifer introduced Bob to the people he had not already met, and then the meeting began. Bob’s presentation was the last item on the agenda, and Jennifer finally introduced him and explained Bob’s interest in cost control and analysis. Bob distributed copies of his CVP data and chart. He described the calculations and explained how the chart indicated a profitable year, if the volume of sales activity continued as it had in the past. He explained that he had not had time to update the information and would like others at the meeting to give him information that would improve his projections. Following are the comments at the meeting. Connie Brock, Manufacturing Manager: You know, Bob, the sales department estimates that unit sales should increase next year. And we’re at over 80% capacity now. I’m not sure about the exact size of the increase, but I know that we’ll be pushing the limits of our capacity, at least. Bob: Once we estimate the sales volume, I can just put that into my projections and we’ll know a lot more about next year’s profits. Connie: Here’s the problem, though. If we increase production above 90 percent of capacity, we'll need to invest more to operate the plant. We’re already planning to buy equipment that will increase fixed costs by at least $25,000 a month. In addition, at 90 percent of plant capacity we’ll face bottlenecks, and production might slow down some. And from your data, it looks like Motor 5 is not really profitable. What if we drop it? That would ease the capacity problems. Bob: Well, I’m not sure exactly what will happen if we drop Motor 5. I’ve just spread the fixed costs across the units using an allocation. I’m not sure how fixed costs would change if we drop Motor 5. Arturo Morales, Sales Manager: Why do you want to drop Motor 5? Motor 15 is the product with slowing sales. I expect it to drop by at least 20,000 units next year. But we ought to pick up that 20,000 and maybe another 25,000 from Motor 5’s production. Motor 10 sales haven’t changed for a while and should continue to remain pretty stable. Bob: Well, I’ll make those changes. Arturo: Wait, there’s more. We've been thinking about changing the price for Motor 5. I think we’re suffering from reputation problems with that motor. Some of our customers have asked if we’re maintaining our usual quality at that low price. My sales people seem to think that we could increase the price by 25% and still increase sales. Mark Zupar, Vice President: As long as you're considering possible changes for next year, let's see what I can add to the picture. First, it seems that taxes aren’t considered here. We always give the government about 30% of our profits. And then we’ll need to keep some money back for reinvestment. We’ve got to buy that equipment to increase capacity, and that will require another $500,000, at least. Second, the union wants a raise for the production crew. Our variable costs will probably increase by at least 5%. If we give those people an increase, we’d better be thinking about raises for management, too. We usually give bonuses based on profits and set aside maybe $500,000 for that. In addition, maybe we need to revisit the way that we give bonuses to the sales force. They get their salaries, plus a commission per unit based on price. Maybe we should base their bonus on the contribution margin they bring in, instead of sales. Third, I guess it’s time to change our product emphasis. No one seems to know which motor is most profitable. The sales staff are just responding to demand and not really pushing any of our motors. Right now Motor 15 is still covering its costs, but if we produce more of Motor 5, it’s likely that Motor 15 will become a loser for us. Maybe it’s time that we drop it. Can you incorporate these changes right now? Jennifer: Thanks, Mark. I thought we’d get a good discussion going about future plans once Bob made his presentation. This CVP approach is something that we haven’t used before, but as you can see, you've all got information to share. Bob will need some time to rework his analysis with this new information, but I’m sure he can get a revision out to us by tomorrow morning. It seems that Bob’s presentation is based on some important assumptions. Most of the questions that were raised were really about those assumptions. It might help us all if Bob lists those assumptions so that we can see how they influence the analysis. Then, he’ll have to incorporate the increase in unit sales and see what’s going on with individual product lines. Also, let’s see how things change with changes in product mix, and we may want to drop Motor 15. Bob will have to incorporate price changes and consider taxes, investment, and raises. Then he can look at the effect of product emphasis. That should about do it. Once we get Bob’s revised analysis, we can all take a look at the numbers and think about them for a few days. We’ll meet again next week. Bob can bring the laptop, and we can do some “what if” analysis on the spot. As she was leaving, Connie said, “Bob, before we meet next time, go down to the production floor and get information. It’s a waste of time for all of us to meet just to give you information. And send the CVP out ahead so we can think more about changes that could occur next year. Also, bring a computer projector so we can all see how any changes affect overall results, then we can make plans for the next period with better information, and we’ll not be caught off guard so often. Bob was annoyed that Jennifer hadn’t told him to go down to the production floor and over to marketing earlier. He also realized that he should have thought about bringing a projector. When he asked Jennifer about it, she said, “Sometimes when we’re introducing a new type of analysis, people need to understand how important their information is to us. Today several people contributed important pieces of information that affect the accuracy of our results. Next time you go out to ask for it, they’ll know that they need to give us their best estimates. Otherwise, they might just give us something off the top of their heads because they don’t want to take time from other tasks. On the basis of the new information, re-evaluate next year’s CVP. Use the spreadsheet you developed for the 3.44 Toddler Toys problem (which was based on Magik Bicycles template provided on BB) and alter it to fit this case. B. List the possible choices given in the case for the amount of (1) fixed cost, (2) the volume per product, (3) price per product, and (4) and the variable costs. C. Pick the values you would use in the spreadsheet and explain why you chose them. D. What is the breakeven point in revenues given the choices you selected in part C? E. Calculate the margin of safety in revenues and calculate operating leverage based on the CVP model created in part C.
F. How can the breakeven analysis help the managers decide whether to alter the existing product emphasis? G. What factors limit the usefulness of this type of CVP analysis? H. Explain how and why biases might affect the CVP analysis for this company. I. Write a memo from Bob Noonan to Jennifer Mackey that explains the value of continuing to hold meetings to discuss CVP analysis. In the memo, provide a plan for gathering information for future CVP analysis. In addition, explain to Jennifer the assumptions and limitations of CVP, and how biases could be affecting the information that managers provide. In the memo, make any recommendations that would help improve operations at San Jose Motors based on your CVP analysis.